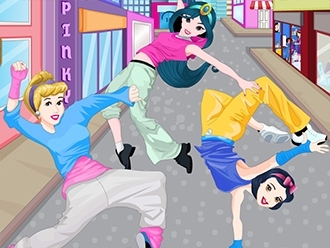 Princesses are getting ready to participate in Zumba dance. The place where they are going to perform needs to be decorated. You would be provided with the enough decorative things. Adorn the place in a creative manner. This evening people would flock to witness the dance. So, adorn the place in a grand manner. Princesses from different countries will join them as it would keep them hale and hearty. Try to complete the decoration as soon as possible. Thank you so much for helping the pretty princesses. The princesses around the world are going to give a stunning dance performance tonight. People will gather to the venue enjoying each and every movement of the pretty princesses. On this day, you are going to play a major role as you will decorate the dancers and the dolls that would be kept in the streets. Give them a grand look. Embellish them so that they might meet the expectations of the spectators. When decorating each princess, give them the appropriate look that would be more appealing. Through this service you will be in the good books of the princesses. We are pretty sure that they will rock tonight with so much of confidence and would make the audience spell bound. You are going to clean the dance studio built for sporty princesses. It has not been cleaned for a few days, therefore it looks a bit dirty. Take all the garbage away and put everything on the right place. 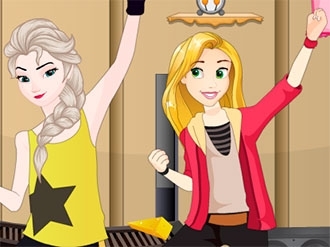 Cinderella, Rapunzel and Elsa will highly appreciate your help! Gangnam Style is striking the world now. Let’s shake our bodies together with Psy! Follow dance steps with the arrow and letter keys. 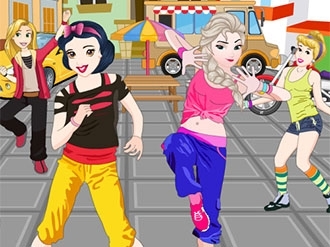 Gangnam Dance Training is a popular skill game on www.bestgames.pk. Try to improve the precision by hitting the key when it comes into the required place so that you can achieve high scores. Nobody will refuse happy steps. What are you waiting for? Show us your awesome dance now!